Financial Disclosure in Divorce: Get it Right! More Organizing the Facts in Your Case: Linking CaseMap, Outlook 365, and Evernote. I want to bring attention to a bill that I think is an abomination. As a lawyer whose efforts have helped determine the caretaking plans for something like 10,000 children over forty years, this bill causes me to recoil in horror! The thoughtlessness and venality that went into writing this bill staggers the imagination. Yet, ten WV legislators signed on as sponsors. Something smells like Limburger cheese at the Capital! I am the father of four, three sons and a daughter, and six grandchildren, four girls and two boys. I am comfortable that my views of this bill are fair to every one of them, and to the men, women, and children of WV. House Bill 2658 refers to “parents’ rights” as if parents own their children, much like Mr. Jefferson did his mixed-race off-spring. I believe “Parenting plans”, above all, should promote the best interests of children. As the Supreme Court has said, “children’s best interests” (not “interest”, the bill’s improper term) should be “the polar star” that guides the parties, lawyers, and courts. It is not an easy read, but reading it will help you understand what a huge step backwards House Bill 2658 is and my view of how there could be a good process for parties and courts to create equitable, child-oriented, parenting plans. We presently operate under a presumption of “shared parenting”, which replaced “custody” vs. “visitation a dozen years or so. The concept of “parenting” is made up of time with children, decision making, and access to the children’s records. The current law does not impose an equal time allotment as a “default”! And to that I say, “Amen”. For fit parents, equality in decision making and access to records is the norm and has been for a dozen years or so. Don’t let the partisans tell you otherwise. The current law, and most parenting plans, require parents to seek out a trained mediator before they sue one another. 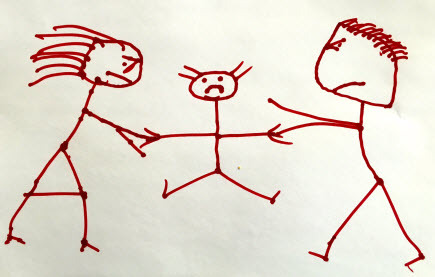 As a result, many disputes are resolved because the parents decide not to spend the money or time on mediation. Sadly, family court tends not to enforce the mediation requirement. A relative few disputes are taken back to mediation. The system would work better if judges enforced the mediation provisions of parenting plans. The “Time with children” allocation is determined by many factors, but, the younger the child, the more the court tends to look at what the parents did voluntarily before the marriage or relationship failed. This is called the history of “caretaking functions”. By statute, the court is supposed to look back one year at the temporary hearing and two years at the final. My preference would be to consider the entire life of the children, and the nature of the parent-child relationship, but I have found the “caretaking functions” standard to be workable and usually fair. Since WV is a more “traditional” and rural state, it should not be a surprise that the typical WV family man works at his job longer hours than his wife and often is happy to have the wife do the majority of the myriad tasks that make up caretaking and nurturing. My experience is that any fit father can expect to have at least three week-ends a month with his children, an evening every week, shared decision making, full access to records, half of all major holidays and 1/3 to 1/2 of the summer. That’s roughly 1/3 of the time. Often, it is the “fun time” that fathers can better utilize with their skill set and experience with their children. The proposed Bill 2658 would create a powerful presumption in favor of “shared legal custody” and “shared physical custody”. The return of these outmoded, proprietary, terms is shocking. It is at the heart of what I dislike about the bill. The court will be locked into a 50%/50% caretaking decision unless it make findings under a “clear and convincing” standard that there are reasons to do something else. Then, the “less worthy” parent will have to settle for second class status. He/she will have only “visitation”, no custodial rights, and no decision making. How “1990’s” is that? Under the current law, even a parent granted decision making power is supposed to do so with “full consultation” with the other parent. Under the new law, that goes away. The term “legal custody” essentially removes the great flexibility that family courts have had to give shared decision making in some areas, while giving one parent primary decision making on something like medical, or religious decisions. The party granted “sole legal custody” simply gets to make the decisions, and the hell with the other parent. In hundreds of mediations, I have seen examples where “best interests of the child” is trumped by what the parent wants for herself or himself. Many times I have seen a negotiation be stalled by a parent’s demand for one extra overnight per year, because that overnight determines whether child support will be calculated under the “basic shared formula” or “extended shares formula”. There really are “90% parents”, parents who wash clothes, bathe the children, clean, shop, plan, visit the doctor, and the school, and devote their very being to their children. Statistically, that person is more often the mother. Under the new bill, that “90% nurturing parent” must give up the children 50% of the time. Does that mean that the parent who was content to be relieved of duties that didn’t suit her or him will now become the nurturer that he/she never was before. Of course it doesn’t. From my experience that person finds his mother or new girlfriend to do those things for him, while he lives his life much as he did before. “But…”, you say. “The court can vary from the presumption simply by making “clear and convincing” findings. Think that is easy? Here is an example. This judge, by temporary order, divided equally the time of a two year old girl who had been cared for 90% of the time by her stay-at-home nurturing mother in spite of the fact that mother had discovered on the father’s phones text messages of over 120 felony drug deals by the father in the year before their separation! That’s right; he texted and received texts arising the purchase and sale of thousands of pills, cigarettes, and vials of illicit drugs. That’s right, enough drug dealing to result in ten life sentences! Iron clad proof! She tried to save the relationship for a year, actually drug testing the father periodically until she discovered he had been secreting bottles of “clean urine” to avoid being caught. A year passed before they separated. He denied her testimony that his behavior was bizarre, and clearly a sign of relapse. The judge criticized the mother for asking him to drug test as an imposition on his privacy! She ruled the evidence of drug dealing was “remote in time”. So much for “clear and convincing”. She appointed a guardian ad litem who knew exactly what this judge expected, and who, surprise, recommended a 50% plan. Because the father was virtually assured of a 50%/50% plan, he showed no flexibility at mediation, so it failed. There went the chance for the parents to fashion a plan tailored to the needs of the infant. Only by failing yet another drug test, during pending litigation, did the father blow his opportunity to have a 50%/50% parenting plan. He negotiated a compromise only when he realized he would lose in a contested trial! That is the bizarre world the new bill will usher into existence. It will re-write much of WV Code Article 48! The bill also provides that WV Supreme Court of Appeals’ beuracrats will create several “templates” or standardized form parenting plans that the courts can simply impose on the parties. I stress, these plans will not be tailored to the child. They will be “standardized”! Sounds like “1984” to me. Finally, child support is currently determined by a formula based on the number of “over-nights” contained in the parenting plan. There is the “basic shared” formula for them one parent is awarded 65% or more of the over-night time. There is the “extended shares” formula for plans where a parent is awarded 50%-65%. (237-128 = “extended shares”; 238-127 = “basic shared”.) It is a bit artificial, but it works. The parties and their counsel can calculate child support and thus avoid a child support trial. Of course, when the parents’ incomes are the same and their time is 50%/50% no child support is awarded, but when one parent makes more, that parent will pay some child support to the lower income parent. The new bill will change the formula by telling the court to consider time spent other than overnight time. Imagine the time that will be wasted wrangling about “non-overnight” time calculation! Just one more thing to fight over. My conclusion is that House Bill 2658, if written into law, will be a disaster for WV families. Unrepresented parties will have their children’s fate sealed after a 30 minute “one size fits all” hearing, and represented parties will find they must allege and prove egregious fault and lack of fitness in order to have a chance of rebutting 50%/50% by “clear and convincing” facts. If they weren’t enemies before, they will be after. And, mediation, which should be streamlined, enhanced, and improved, will be diminished and made more difficult. It will be a “perfect storm” of bad news for children.